Rick Childs Giving a Sermon. 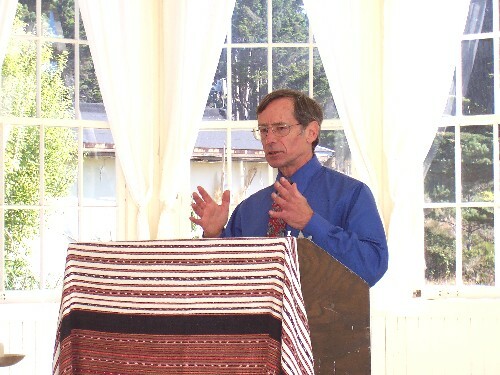 These are essays on spirituality that Rick Childs, our lay leader from 2002 until 2011, wrote for our newsletter. Read more about Rick Childs. If you spend 10 - 20 minutes every day concentrating on something small that gives you pleasure - fully concentrating on it, enjoying it and it alone - you'll find that pleasure acts as a spiritual tailwind, to make the rest of your day easier and more enjoyable. When I was building my house, my builder told me something that's stayed with me for 22 years now: "There are things that you'll never see that are in your house." Things like more nails than required by the building code; stronger bracing where he thought it would help, should a bad earthquake hit; and the smallest possible holes in the wall studs for the wires, so as not to compromise the stud's strength, even though it made feeding the wires through them rather difficult. You can learn a lot from carpenters. We might ask, "What would my life look like if I ... (fill in the blank: were always on time; didn't always need to be so busy; stopped trying to control everything, etc.)?" as another way to ferret out what’s really driving our behaviors. How to make difficult decisions, and how to be sure you make the right choice. This is the third of three essays on meditation ... an in-depth exploration of the "black box" of the meditation process: just how and why it works. This is the second of three essays. It tells you the physical and mental benefits of meditating on a regular basis. This is the first of three essays. This one explores the ABC's of meditation, how it's practiced, and what one might experience meditating. If you spend a few minutes every morning to reflect, meditate or center yourself, you'll find it helps you for the rest of the day. Grand in scope, service is, at its core, the conscious effort we undertake to better the lives of others; our friends, our counrymen and women, those on our planet. Service is at the heart of all religion. Rick suggests we make it a spiritual practice. If you slow down - "let time go limp" every once in a while, you may attain some spiritual insights. You can spend two weeks at the beach and come back with nothing more than a sunburn; or, spend two weeks helping to make the world a better place and come back with a deep sense of satisfaction. Giving yourself a "Do Over" can sometimes turn mistakes into transformative growth. What will we leave behind, in goods and in the memories of those who knew us? Such a wonderful thing to have - and to feel. So invigorating, so rewarding - so making-life-so-alive-and-worth-living! We all have people and interests and things we care about - but when we feel passionately about them, we feel an energy surge and pleasure from deep within. What are you passionate about? How can we rise to that wonderful spirit and beauty of true, meaningful giving? It's certainly hard, given the sheer weight of the holiday ... but we can make inroads. Rick Childs meditates on the phrase 'I Deserve'; can we accept things gratefully - and gracefully? The spiritual rewards of taking a moment to reflect on the things you are grateful for, every day. Rick writes about his hopes and fears for his summer in the West Bank. A short lesson in Zen meditation, and its benefits. Rick uses the sleeper hit "Mumford" as an example of self acceptance. Some of the ways we show love for ourselves include: recognizing and valuing our positive qualities, forgiving ourselves of past mistakes and shortcomings, nurturing ourselves ... and respecting and accepting ourselves. An essay about facing the inevitable with courage, dignity and grace, with some practical advice, too. Rick writes about the spiritual message in Barack Obama's innauguration ceremony, and the message of diversity it sent - even if we don't want to be that diverse. How many conservative republicans do you know? Rick meditates on "Esse", a popular crossword puzzle word, which is Latin for "being", and the Buddhist goal of being here, now. Rick proposes generosity as a solution to today's economic problems. Art Johnson has passed on. His message lives, however; that We Unitarian Universalists need to be here ... as a sanctuary for all those in the community who'll be looking for comfort, support, and liberal spiritual values. We offer a beacon of light in dark times. Rick continues to explore the Knoxville shootings. The man who did it was in deep pain. There may be others, whose pain we can ease a bit, if we try. In the wake of the Tennessee shootings, Rick begins an exploration of why bad things happen. It isn't fair, it isn't right, it isn't just; but it has happened. It is. Summer brings more sun to us - and allows us to contemplate our connection to the most basic force in our world. The value of having a UU symbol around the house. Living and celebrating a robust physical life as a spiritual practice. Lessons from a penny tray. Overcoming negative self-impressions. (2 of 2). Overcoming negative self-impressions. (1 of 2). Adjusting your expectations around the Holiday season. Drawing a map of your spiritual journey as a way of understanding where you are, and how you got there. Reflections on the Muslim saying about mountains and wheelbarrows. Attaining a positive self image. Spiritual lessons gained as you see other lands and meet other people. Opening deeper connections with Nature. A new way to look at attendance. Spiritual lessons from the dark side of human existence. Musings about faults and failings at an awards ceremony. Reflections on a real-life Santa Claus. How looking on the bright side can make you feel better. Our theology as a springboard to growth. Each of us has a "Gettin' Place" . . . a place each of us knows, intuitively, we can go to, whenever we needed help, comfort or a breakthrough idea. You can see humans as vats, born full, but whose innate goodness leaks out as they age. Athletes have a sweet time when they are "In the Zone". We can too. A prayer seeking forgiveness from both sides of the aisle, and for those on both sides. Spiritual lessons from Hopalong Cassidy. Thoughts on deepening of our ability to give and receive love. Ways to make Christmas more spiritual and less commercial. Many people attest to the great benefits of journaling . . . as a general practice, but especially for working through problems. The value of unconditional love, and how it differs from other kinds of love. Reflections on public silence during the Holocaust. Where and when to count to ten. Generativity is the term, generally attributed to psychologist Erik Erikson, to describe his Stage 7 development (in his 8 stages of a "life well lived"). It is "the care for the future world" that typically develops in mid-adulthood. Some thoughts on what our being "active seekers of truth" implies. Getting "foppy" but finding some spiritual insight from the holiday anyway. Looking both ways as the old year ends and the new one begins. How we can help heal the wounds this election wrought. (2 of 2). How we can help heal the wounds this election wrought. (1 of 2). Each of us has inherent creativity, lying dormant, untapped - - awaiting our "inspiration and perspiration." The oil in our spiritual machinery.